The Creform cart has three angled shelves for totes or boxes on each side for easy access, along with integral bin lid storage. The Creform cart has three angled shelves for totes or boxes on each side for easy access, along with integral bin lid storage. The open design allows visibility for safe maneuvering. The Creform System of steel pipes and metal joints makes it easy to reconfigure the carts as needs change. Color pipes are available for color-coding, and ESD pipes and joints are available for handling static-sensitive products. 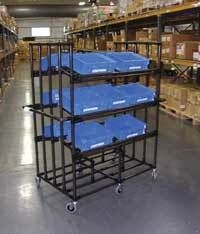 The carts can be customized with hooks, label holders, holsters, writing surfaces and tow bars.